Now let’s see what exactly happens when MS SQL traffic is performed. The MS SQL network traffic is not that complex, but I will explain in advance what you will see in the next Wireshark and Process Monitor print screens. In a non-academic explanation: MS SQL is by default configured to use 4096 bytes as maximum size for a network packet. So, when MSSQL server is sending the data to the network adapter is actually sending chunks up to 4 KB (4096 bytes) of data. Continuing the MS SQL explanation: actually those MS SQL small chunks (up to 4 KB each) are sent over the network in much smaller size packets. The size of those packets is in direct relation with the Maximum Transmission Unit size. Let’s pause again the explanation and mention in the absence of Large Segment Offload (LSO) (TSO / TCP Chimney Offload) the data MS SQL is sending over the network will be directly divided to packets in size with the Maximum Transmission Unit. On the other “end of the wire”, the system who is MS SQL client will receive network packets who will not exceed the Maximum Transmission Unit size. The purpose of this explanation is to help reproduce as close as possible the MS SQL network traffic using IOmeter. 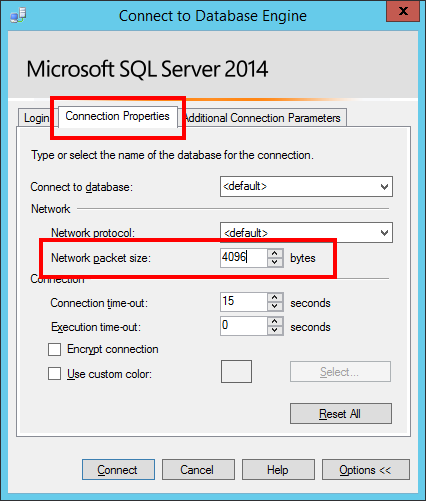 The Advanced MS SQL server properties: the Network Packet Size is set by default to 4096 bytes. The clients can also control the Network packet size. 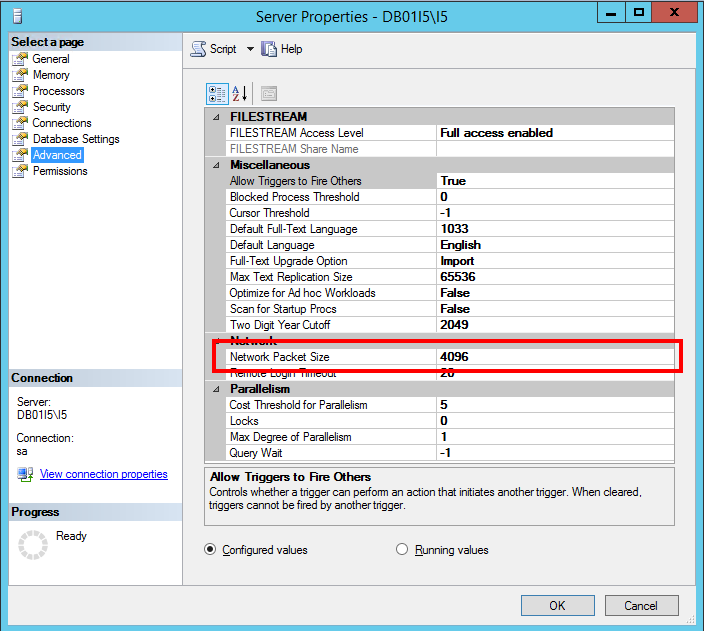 In the SQL Server Management Studio this can be done through the Connection Properties tab. For .NET clients this connectivity parameter can be controlled via PacketSize Property of the SqlConnection class. In this first MS SQL query & response network capture, I started with a T-SQL query who I knew will generate a small response (from data amount point of view). The Wireshark network capture performed on the client side, indicates frame no. 1 is the MS SQL client request sent to the server. As a proof we can convert the data section of this frame to Printable Text (String). As a comment with no reference to this article – the MS SQL traffic (T-SQL requests and responses) can be easily captured over the network and converted to non-binary format. If this is a security concern, then MS SQL provides the possibility to encrypt the communication channel with its clients, but it requires additional configuration in order to achieve this. The Wireshark network capture performed on the client side, indicates the frame no. 2 represents the response the MS SQL server provided to the client. And the Wireshark network capture performed on the client side, indicates the frame no. 3 represents the Acknowledge the MS SQL client sent back to the server to confirm the response was received. The Wireshark network capture performed on the server side shows pretty much the same thing we saw in the Wireshark network capture performed client side. 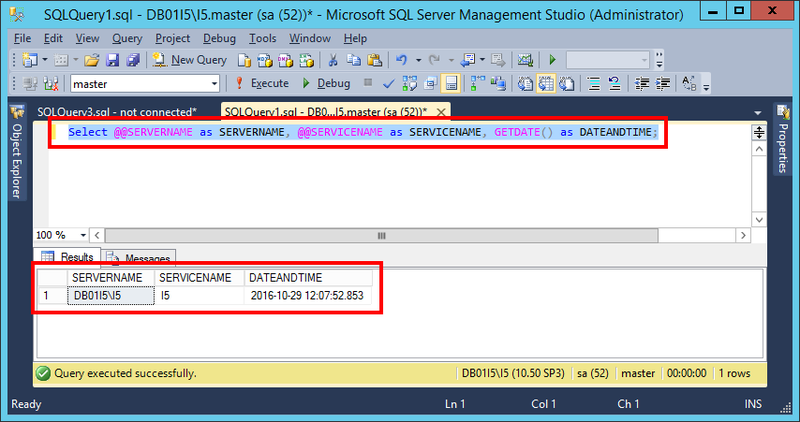 Now, let’s do the same thing, but this time for larger sets of MS SQL data. 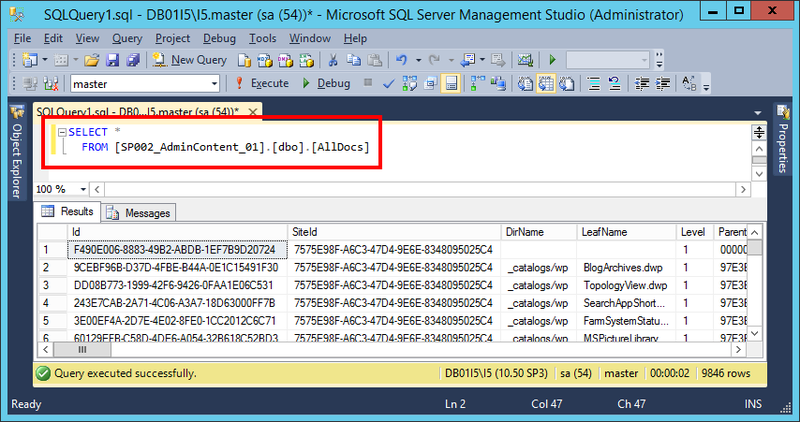 This query is actually extracting around 14 MB of data from the AllDocs table part of a SharePoint content database. 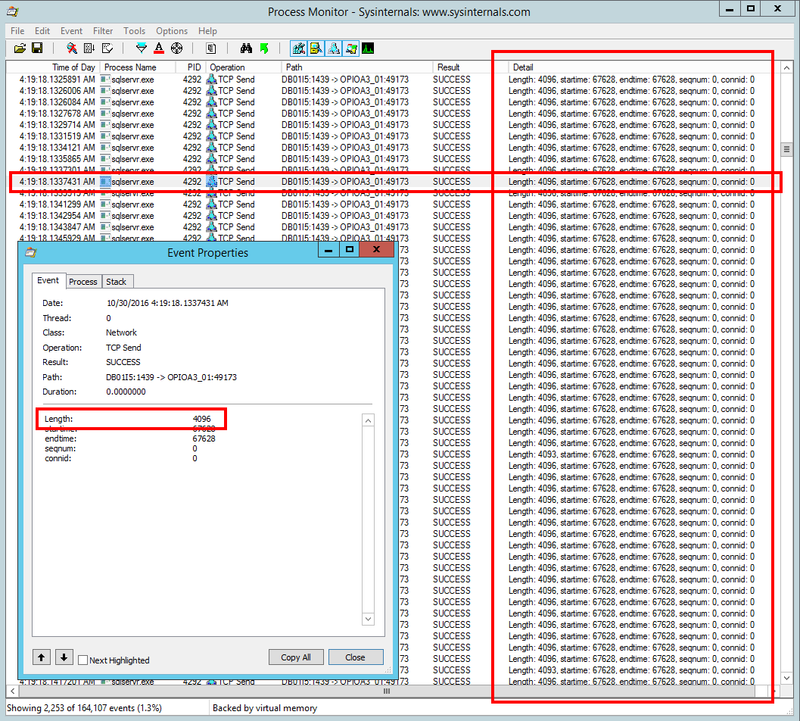 The capture performed using Process Monitor and Wireshark on the server side indicates the maximum size of the sent packets from MS SQL server are in size of 4096 bytes. 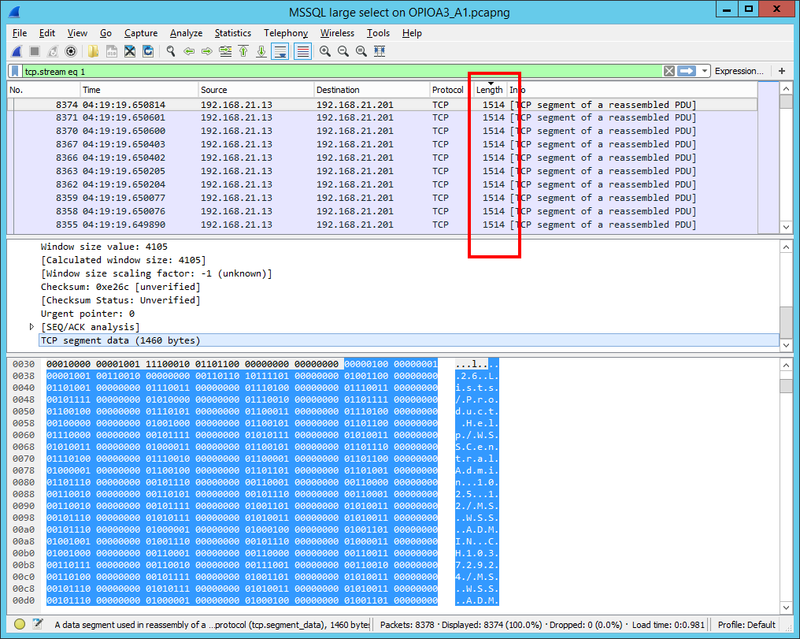 The Wireshark network capture performed on the client side, indicates that maximum size of the received packets from MS SQL server is not exceeding the default Ethernet MTU (1500 bytes). Please note the capture is sorted based on the maximum size of the frames. the MS SQL server is by default configured to use 4096 bytes as maximum size for each network packet sent to the network interface card. 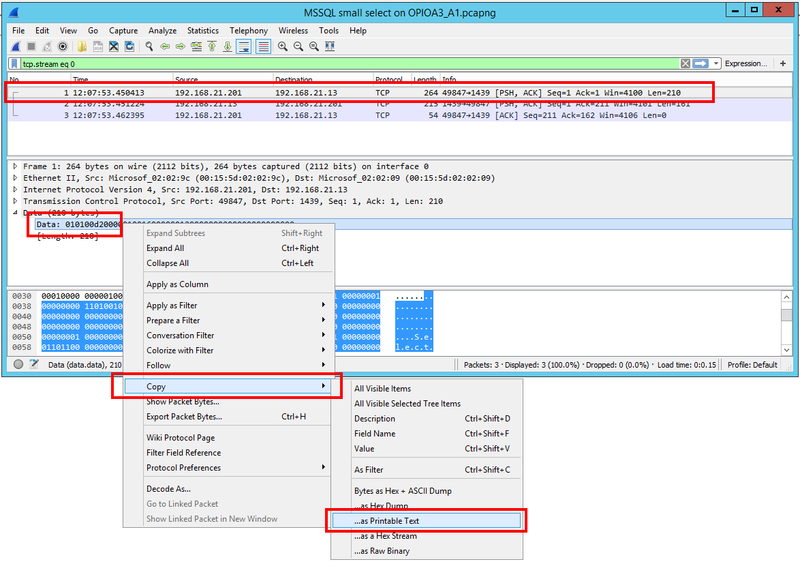 the MS SQL clients are also configurable in terms of the maximum network packet sent to the network interface card (e.g. 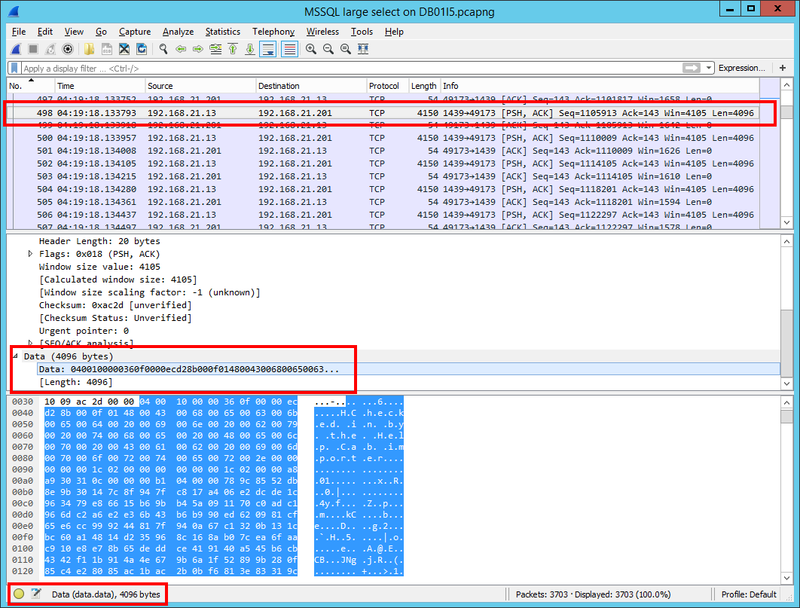 : by default SSMS is using 4096 bytes as network packet size). each 4 KB data chunks are actually sent over the network in much smaller size packets (the size of those packets is influenced by the MTU size). on the other “end of the wire”, the system who is MS SQL client, will receive network packets who will not exceed the Maximum Transmission Unit size. Again, this explanation will help reproduce as close as possible the MS SQL network traffic using IOmeter.